NOTE: the price listed is for the smallest size available in the most basic configuration. Additional charges will apply for larger sizes and for optional accessories. Eye to eye, smile to smile — engaging with peers is so much more rewarding for individuals with special needs when they can interact in an upright and mobile position. And the Mobile Stander, a mobile prone stander, makes it easy — even for those with no weight-bearing ability. The Mobile Stander provides new independence and standing mobility for wheelchair- bound clients. More importantly, this Mobile Stander helps strengthen critical motor skills so a user can progress toward independent standing. 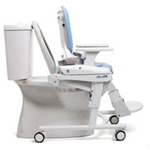 With the Mobile Stander’s removable large wheels in place, clients can self-propel in a standing position – free to explore their surroundings alongside (and often ahead of!) their playmates. 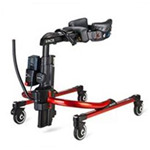 Remove its large wheels, and the Mobile Stander easily rolls right up to a table or a counter enabling participation in crafts and other stationary activities. With regular use, the Mobile Stander provides a way for clients to strengthen motor skills and work toward independent standing. 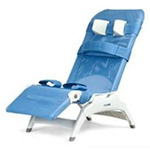 Healthcare grade vinyl covers padded body support. Body support adjusts according to user’s size and requirements. Soft fleecy strap provides back or neck support. 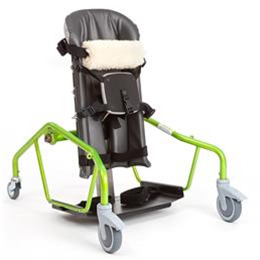 Adjustable seat pad allows gradual increases in weight-bearing and develops standing skills. Extra wide deck for simpler transfers and more user participation in the sit-to-stand process. Large casters allow the stander to move easily during activities, yet lock securely during transfer. 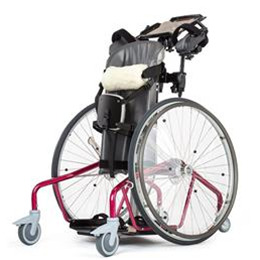 Overall Length & Width (Lg): 39" x 33.5"
Overall Height (Lg): 37.5" - 49"
Width Without Big Wheels (Lg): 28.5"
Width of Body Support (Lg): 10" - 14"
Height of Body Support (Lg): 36" - 48"